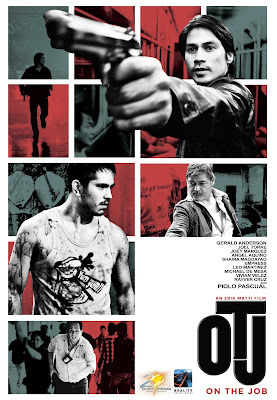 Home / Angel Aquino / Empress Schuck / Erik Matti / Gerald An / Joel Torre / Joey Marquez / movie / OJT / On The Job / Piolo Pas / Rayver Cruz / Reality Entertainment / Shaina Magdayao / Star Cinema / Vivian Velez / Piolo Pascual, Gerald Anderson star action-thriller "OJT"
Piolo Pascual, Gerald Anderson star action-thriller "OJT"
Star Cinema proudly presents another internationally-acclaimed movie top billed by two of today's most popular leading men - Piolo Pascual and Gerald Anderson. Directed by Erik Matti and co-produced by Reality Entertainment, the action-thriller "OJT" (On The Job) is part of Star Cinema's 20th anniversary celebration. Pascual stars as an NBI agent in the movie aiming to capture the professional hitman portrayed by Anderson. Along with the two Kapamilya stars are Rayver Cruz, Joel Torre, Joey Marquez, Shaina Magdayao, Angel Aquino, Vivian Velez and Empress. OJT is set to be released in cinemas nationwide starting August 28.